The graph shows decelerating year-on-year trends for consumer goods and intermediate goods with capital goods inflation low and essentially flat-lining. 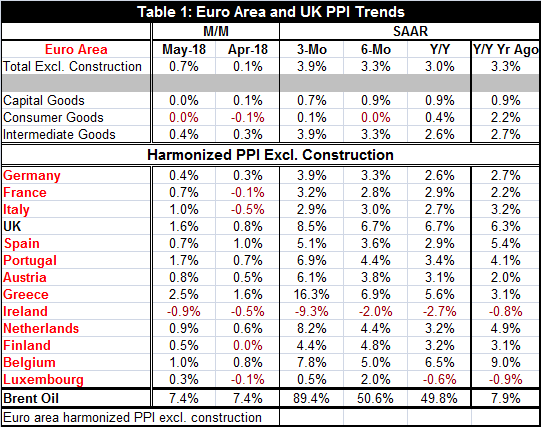 However, the table, which looks more at trends at 12-month and less, shows PPI acceleration for the total PPI excluding construction and for intermediate goods. For consumer goods and for capital goods, inflation trends remain tranquil. As a result, PPI trends in the EMU are very mixed. Three-month annualized inflation is higher than 12-month inflation for every country in the table except Ireland. And six-month inflation is greater than 12-month inflation for every country except three: France, the U.K. and Belgium. But if we compare 12-month inflation today with 12-month inflation of one year ago, inflation is higher in only five countries: France, the U.K., Greece, Austria, and Luxembourg. It is lower in seven. Part of this is probably due to oil prices. The table below shows that the highest correlations with oil prices are for overall manufacturing prices and for intermediate goods followed by consumer goods with a substantially smaller correlation for capital goods prices. Table 1 shows that Brent prices have been rising tenaciously over the past year. They are up in simple monthly terms by about 7.5% in each of the last two months. Brent prices have accelerated from a 50% annual rate over 12 months and six months to an 89% annual rate over three months. Oil prices are a clear contributor to rising intermediate goods prices and to rising PPI inflation. One year ago, the 12-month increase in Brent prices was only 7.9%. That’s why the acceleration in Brent prices has been able to boost current inflation by so much especially recently. Yet, for the full year-on-year comparisons, inflation is lower over the past 12 months than over the previous 12 months. There is a great deal of inflation anxiety around at least on the part of policymakers. Private sector surveys show that the public is relatively convinced that inflation will remain low. By contrast, policymakers, whose responsibility is to keep inflation low, have great fears that prices could be rising. A synchronously growing global economy coupled with tight labor markets is seen as a classical inflation trap waiting to be sprung. It is partly the fact that central bankers do not take low inflation as a given that markets can be so copacetic about the outlook. On the other hand, there are also changed market dynamics that make tight labor markets less a factor than they might have been in the past. Firms can more easily source overseas labor, technology offers a lot more opportunities to use existing labor more efficiently, and information technology has kept consumers, businesses and close competitors aware of prices, a factor that has caused firms to be more careful and less aggressive about raising prices. In short, inflation tends to be more sticky at lower levels. In this economy and the real risk may not be of inflation rising but of central banks too afraid of inflation rising and too wedded to old economic models so that they act more aggressively than circumstances warrant. It’s fair to say that many central bankers these days feel that they are behind the curve as far as raising rates or the level of their policy rates is concerned. But what if they are wrong? What if they wait for the glimmer of growth they need and use it as an excuse to raise rates too soon or too much? Is it possible that the real risk for central banks is that they will reverse policies of accommodation to soon because they are afraid of making the classic central bank mistake of staying too easy for too long? Yes, it is possible and it is something to be on guard for. We are a decade past a nasty recession and financial crisis. Yet, we still do not have inflation cruising at the neutral pace central banks seek. While resource usage is back toward normal, a number of special circumstances warn us about taking unemployment rates too literally. Clearly, the world has changed. And just as clearly…central bankers have not.